Undoubtedly, I had to take notice when I heard that Polish composer and keyboard whiz kid Wojtek Szadkowski (Collage, Satellite, Peter Pan) had another project of progressive rock coming together. I'm a major fan of Satellite, and this fellow is a true mastermind in the field. With Strawberry Fields, Szadkowski has built a prog rock ensemble built around the ethereal vocals of Robin (aka Marta Kniewska) and fellow Satellite compatriots Sarhan Kubeisi (g), Jarek Michalski (bass), and a guest appearance by keyboardist Krzys Palczewski. The result is 'Rivers Gone Dry,' an atmospheric, nearly psychedelic, collection of formidable progressive rock compositions. If you can't wait for The Gathering's forthcoming release, I suggest you jump on this one. A simple listen of this work proves that the centerpiece of Strawberry Fields is obviously Robin's vocal performance. Her voice is distinct and mature; she never over extends and, within every composition, sounds lush and provocative. Close and Open Your Eyes are two songs that highlight the strength of her performance. The latter piece especially shows Robin's dexterity as she moves between both the subtle and heavier movements with the ease of a veteran. 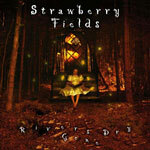 Both songs also show the strength of song composition and musicianship from Strawberry Fields. Yet, the killer track is the extremely viable and moving Fool where the arrangements displays melodic accessibility through an awesome bass line and stunning guitar solo. I found only two songs slightly limiting. The title track had a wonderful airy psychedelic vibe, but was slow and plodding; later, I found Maybe to be moderately interesting progressive rock, more droll than compelling. Yet, despite these stumbles, 'Rivers Gone Dry' is a sparkling catalog of masterful progressive rock. Robin (Marta Kniewska) is accessible and mesmerizing in her debut. Fans of The Gathering and even Portishead will find this a first class addition to their prog rock catalogs. Very recommended! 'Rivers Gone Dry' is a sparkling catalog of masterful progressive rock. Robin (Marta Kniewska) is accessible and mesmerizing in her debut. Fans of The Gathering and even Portishead will find this a first class addition to their catalogs.